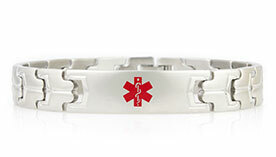 Choose the style you prefer, and we will engrave it with your Non-Celiac Gluten Sensitivity diagnosis, medications, treatment considerations, and other pertinent information. There are several gluten-related disorders including autoimmune, allergic, and innate reactions to this common protein. Celiac Disease, which impacts approximately 1% (or 1 in 133) of all Americans, is an autoimmune disease, whereas wheat allergies are not. Current research places Non-Celiac Gluten Sensitivity (NCGS) in the “innate reaction” category, as it appears to be non autoimmune or allergic in nature, lacking the antibodies, intestinal damage, and allergic markers seen in the other two categories. Non-Celiac Gluten Sensitivity is a relatively new diagnosis and one that is becoming more frequently identified and better treated. The key to treatment is complete gluten avoidance, which can be difficult as gluten is present in foods, medications, health and beauty products, adhesives, and more. 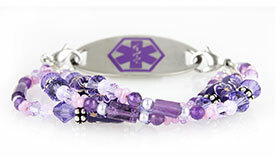 People with NCGS are often surprised to know that they need to wear medical ID jewelry. However, in an emergency, you may be given unfamiliar medications, and many common drugs contain gluten. In addition to the emergency for which you are being treated, compounding the situation with gluten exposure can make a bad situation much worse and may make it harder to determine the cause of your symptoms. 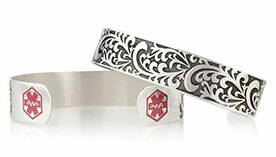 If you or someone you love has a Non-Celiac Gluten Sensitivity, medical ID jewelry is imperative. 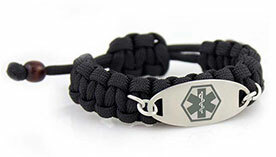 We recommend listing your name, diagnosis(es), any medications, all allergies, and emergency contact numbers.